“Hey Doug, were there any off-brand unpopular toys that you didn’t have?” I’m glad you asked. Apparently, the answer is, “No.” As you know, I frequently got my toys from the bargain bins at Kay Bee toys, such as these wonders from the Advanced Dungeons and Dragons lines. They were only the tips of the proverbial loser toy iceberg, though. There were several other toys that I pulled out of those bins, toys that I just barely remember and only just now happened upon in a search for some other toy I had. This is the Demon Rider from Dimensions For Children Dragon Riders of the Styx line. I distinctly remember getting this one on a Friday night. A friend was with me and he got one as well. We played with them while watching the New Twilight Zone. The “demon” is nothing to get excited about; it looks more like the car for a haunted house ride than an actual demon. The rider, though, is pretty cool. He has knee joints and his faceless face makes him a real unique figure. As I recall, it was very difficult to get him inside the demon, and once he was in, you couldn’t get him out. The Other World line from Arco had bendable figures. They didn’t have joints or articulation points; they could just bend. I was extremely young when I had these and can’t remember just how many I had. But I do remember the little figures that came with the main figure and their weapons. There were a lot of these figures (including a two-headed one named Skitzo, I kid you not), some mythical animal steeds (motorized, no less) and even a playset, which you can see here. Ideal’s Manglords (or Manglors, I think it was spelled both ways) were pretty strange. I only had the set above, which had a Manglord and a slime pit playset, but there were several others. The slime pit worked okay. I seemed to remember that it kind of lowered and raised the figure into the slime (which was hidden inside the “mountain”). It took a lot of pressing the button, though, and you could hear the bubbling as the slime fought to keep the cage from raising. The figure didn’t work anything like advertised. You were supposed to be able to rip his limbs off and then put them back on. That feature didn’t work at all, as I found out as soon as I opened the package and tore the Manglord’s leg out of its socket. I had a legless Manglord from that time on. I still had fun with him, though. I imagined that he was a Swamp Thing-like character who could jump from tree to tree in a primeval forest. Dimensions For Children also made some fantasy-themed plastic figure playsets. This is the toy I had been orginally looking for this evening. I had the “Tower Of The Night” set (which is not the one pictured above but very similar). It had all sorts of fantasy characters, including wizards, elves, and orcs. The set was, in fact, was my first exposure to the orc race (I had never heard that word before), and for that I’ll be ever grateful. There were several of these sets, and you can see them here. So what can I say about these toys? Well, they’re weird. I think we’d all agree. They are straight up weird, maybe a little too weird for an impressionable young kid on the west side of Columbus. But, as I think we’d all also agree, they’re a little wonderful as well. Do You Recall The 1980’s Computer Warriors Toy Line? There Was A 1976 King Kong Panorama Colorform Set?! I had all those too. I’m not sure which Manglor I had though. For the record, I think the series was called Manglor and the individual one you had was named Manglord, as the sort of flagship character. Mine was very short lived, as I immediately ripped off all of his extremities only to discover as you did that the marketing was highly exaggerated. A torso and a set of disembodied limbs didn’t really fit into my play style, I guess. Awesome stuff! The weirder the better! Turns out after reading this and checking out the links I have Zendo, from The Other World. I Still have him but had no idea what he came from. Now I know, thanks Doug! Maybe you guys just had bunk Manglors? Because when I was a kid, I had a man shaped Manglor and a dinosaur that came out of an egg and could take their arms and legs off over and over and they always went back on. @ Matt, I think that’s probably true. I often got toys on discount, so it’s possible that mine was older and had dried out, reducing the sticking ability. I’ve seen YouTube videos of guys pulling off their limbs and resticking them in other…um…interesting places. I had the Fires of Shandarr DFC playset, Dragonman and a Wizard from Dragonriders of the Styx, and a ton of the Otherworld guys (including Frogacuda – what kid could possibly resist a Frogacuda?!?!) I did not have a Manglor but had a friend who did. I got a lot of my toys at the local grocery store, which apparently carried all the weird stuff too. Great memories! Doug, you and I were just grabbing up the same toys at the same time, just in different stores. I too had a Manglor and it didn’t work as promised…I took mine back to the toy store and after the manager messed with it for about a minute he laughed and told me to just go ahead and pick something else. The guy was kind enough to even raise what toy I could purchase by $5. So I grabbed this! 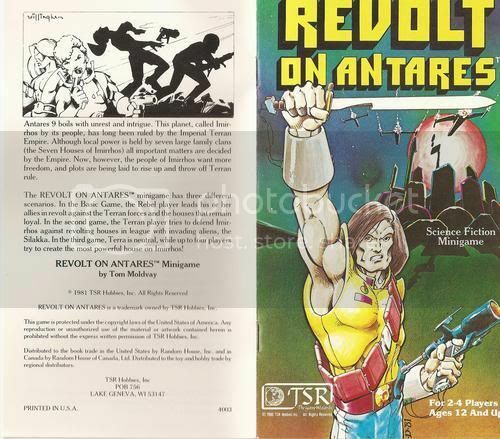 TSR’s Revolt on Antares minigame. regarding manglord, I had the original “figure” when I was in my single digits, while not amazing he did sort of have tackyness that allowed you to re-stick severed limbs, I also remember him having a bit better color scheme. years later when i was maybe 12, my cousins and I were in some dollar general -type store and the had the slime mountain one. I was so stoked to get it and encouraged them to get it as well, the box made it seem like the slime would help the stickiness, and manglord should work even better than the one I used to have. After being dissapointed in the weaker color scheme and encouraging my 3 cousins to rip their Mangalord’s limbs off we all we upset when they would not stick back on at all. To the Mountain I declared, and the slime if anything made the figures less sticky. They we all pretty pissed at me. Loved the “Other World” action figures. My aunt used to by them for me all the time at a local discount shop. Good times. I am giddy with excitement…Read this on twitter post. I had Manglor Mountain & have been trying to recall the toy line it came from & it’s name for a long time now…& Here it is! Remember getting it at a local department store pre-Wal Mart days. Didn’t play with the manglor guy much but tortured alot of my GI Joes in the slime pit! I had forgotten you could pull him apart and he supposedly stuck back together. Part of my memory has been restored.